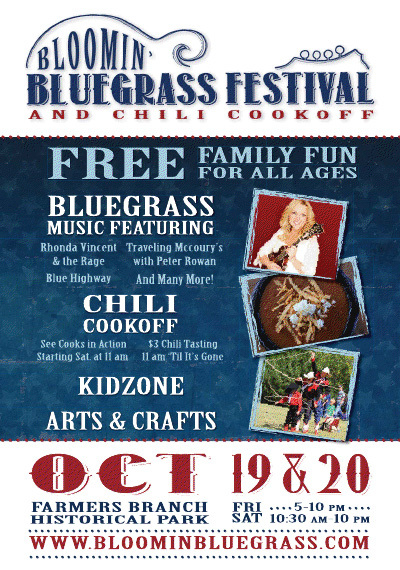 This week's giveaway is sponsored by the Bloomin Bluegrass Festival and Chili Cookoff. The Bloomin' Bluegrass Festival is a free, outdoor event in the beautiful Farmers Branch Historical Park. There will be a great marketplace for exhibitors to sell their arts, crafts and merchandise. This event also features live Bluegrass music, a Chili Cook Off, a KidZone and the magnificent Rose Gardens of Farmers Branch. They are expecting over 5,000 people over 2 days. How to enter: Simply leave a comment here and tell us your favorite festival memory. For a BONUS entry, share this giveaway on Facebook or Twitter (don't forget to tag us) and comment again below to let us know. Please don't forget to leave an email address, if I cannot contact you then you cannot collect your prize! Facebook entries can no longer be accepted. Contest ends at 10:00PM on Tuesday, September 25, 2012. Winners will be announced Wednesday, September 26, 2012. Entries open to the US only. Congrats, Maria! 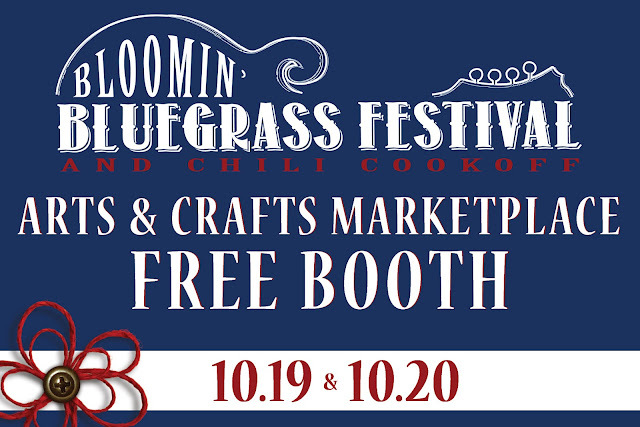 You have WON a 12 X 12 booth space at the Bloomin Bluegrass Festival and Chili Cookoff, a $20 value. You will need to fill out an arts & crafts application, which can be found on DFW Craft Shows. Looking for more information about this event? Be sure to visit their website and stay tuned to their Facebook page! Our favorite festival memory is just being in the fun environment! We are happily making festival memories this year as we prepare our handmade crafts! So excited for the opportunity to be a part of the Bluegrass Festival this year! My best memory is all the fun my family and I have from shopping, to buying items and food tasting. I can already smell the kettle corn, the cotton candy and funnel cakes. My favorite craft show memory was my highschool craft shows!local crafty vendors, friends and parents enjoying hot chocolate and walking around enjoying all the vendors!love the holiday seasons and craft fairs just top off the holiday spirits! My favorite memory is from high school. My theatre group was competing in Lubbock, and there happened to be an fun and festive craft show going on next door! Needless to say, we spent our lunch money there! And I just tweeted the giveaway as well! My favorite craft memory is meeting and seeing all the other vendors and all the different things everyone sells, and actually getting to meet and interact with my customers.